Alice and me, just like a scene from Frost/Nixon. Few bits and pieces to update you with but am feeling so foggy in my head this Sunday evening (a few wines last night, an early start this morning), that I’m not sure I’m going to explain it in a very amusing fashion. Bear with me. Evening Standard column from last week HERE. Can I just say on the Dubai front, I know the story doing the rounds that, actually, Ellie was arrested for heading out there to stick botox in people’s faces without a license. And I appreciate that’s pretty bad. But I still don’t think it warrants three days in a cell and a possible year’s detainment. My point remains that, although I had a great time for two years there as an expat, you do feel like you’re living on a precipice. Put a foot wrong and, whoops, you’re in prison for a decade. Today’s Sunday Telegraph column HERE. Got into a Twitter discussion with a chap today who called it a load of ‘tosh’ and said I was a fool because ‘working class people drink tea in random mugs’. Yes, fine, I didn’t say they didn’t. All I’m saying is posh people *also* drink in random or mismatched mugs. It’s the Hyacinth Buckets of this world who mind about having matching ones. Then I spent this morning at The Ned in London chatting to the brilliant Alice-Azania Jarvis about The Plus One for her literary salon. Do go if you can. Apply early for tickets. 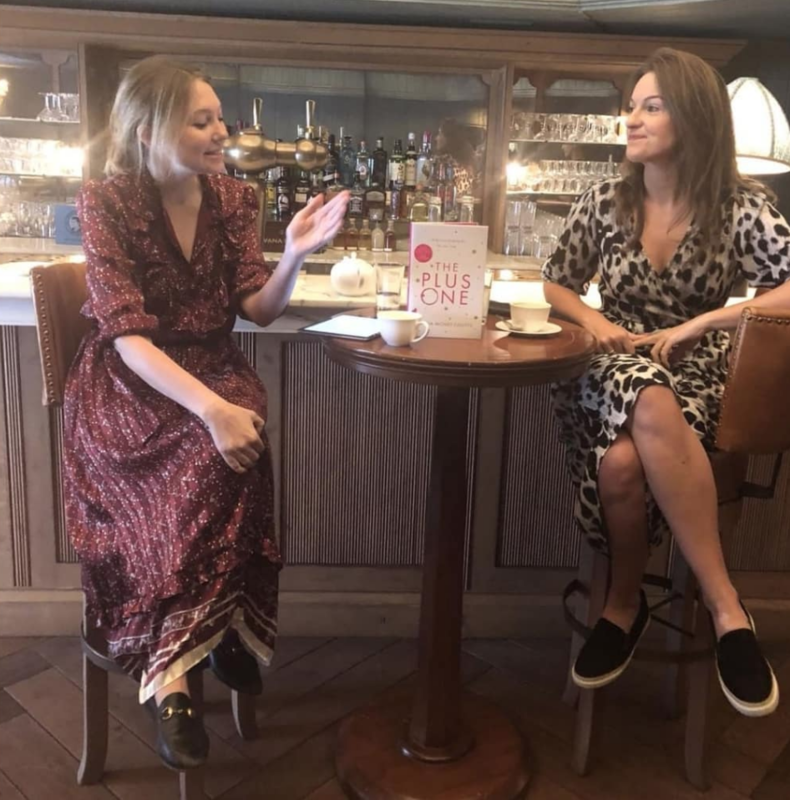 The Bookseller recently said it’s ‘The most compelling chat you can get in London and the waiting list to get in is getting about as long as Givenchy’s in the Markle aftermath…’ Held every month, it’s just a lovely, informal chat about a new book in a posh location with views over London. And good coffee, which I needed because of the wines. 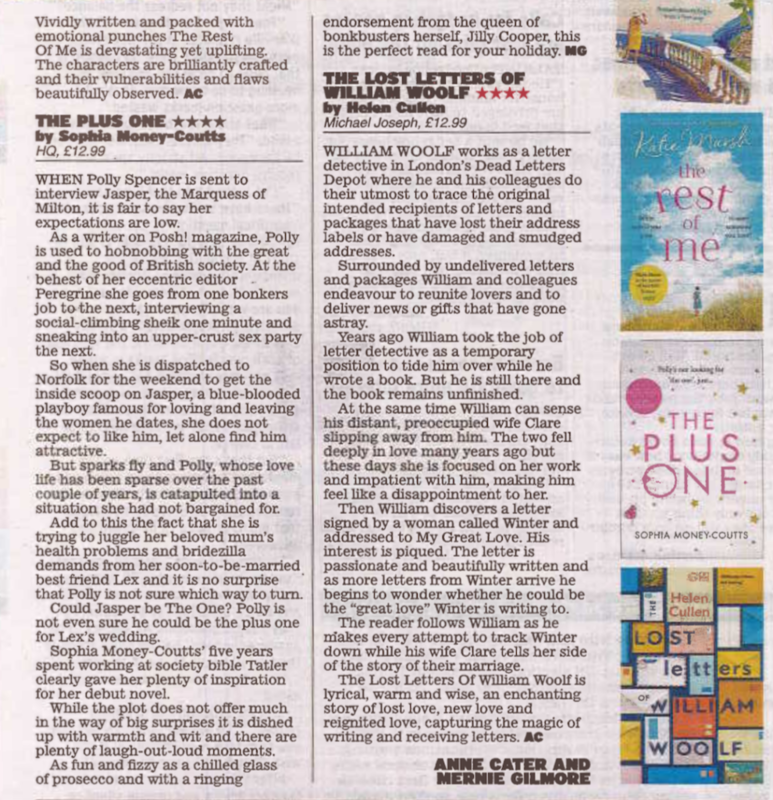 The Express ran a great four-star review of TPO this week too and I went into the Hello! offices and did a Facebook live. Watch it HERE. 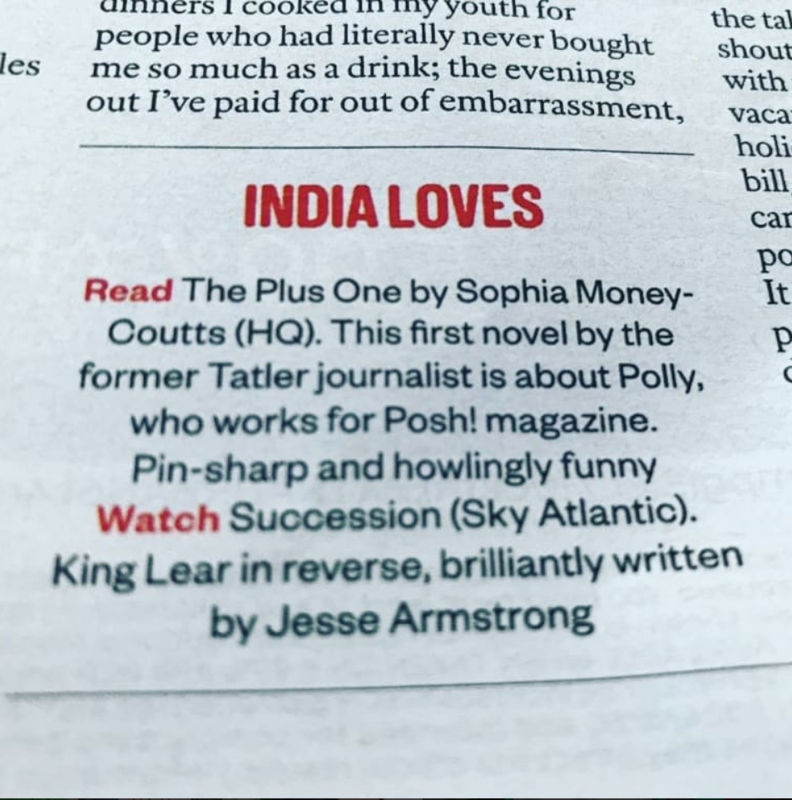 And then, to round it all off, I’ve just found out that India Knight mentioned the book in her Sunday Times mag column today. Having cried already a few hours ago because am feeling bit tired and mopey, it’s made me teary all over again. I love India, I think every word she writes is always bang on, always funny and just brilliantly SENSIBLE, and she’s one of those columnists who my mum and I frequently ring one another about to make sure the other has seen. “Have you read India today?’ So that’s finished me off. And now I’m going to have another wine to celebrate.